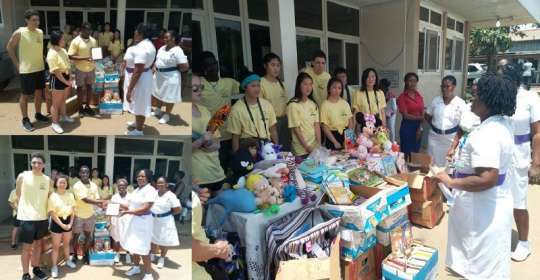 Hugs for Ghana, a nongovernmental organisation, on Tuesday donated assorted medical items, toys, academic and sport items to the Child Health Department of the Korle Bu Teaching Hospital (KBTH). The items included thermometers, catheters, stethoscopes, forceps, story and exercise books for children between the ages of six and 16 years, and footballs. It was to support the Department and the health workers to give proper care to the children. Mr Joel Bervell, the Chief Operations officer of Hugs for Ghana, said his late grandmother with the zeal to support the poor, needy and vulnerable in the society initiated the donation exercise 12 years ago. He said the family, therefore, decided to continue undertaking the benevolent act in honour of their late grandmother. Mr Bervell said similar items all at a total cost of $50,000 would be donated to six other institutions, including the Osu Children’s Home, Princess Marie Louise Children’s Hospital and some educational institutions in the Western Region. Mrs Agnes Ofosu-Boateng, the Deputy Director of Nursing Services at the Child Health Department, who received the items on behalf of the Hospital, expressed their gratitude for the kind gesture, as it would go a long way to help the children. “Children are happy when they see such items and we believe it would help them to forget the pains they are going through,” she said. Mrs Ofosu-Boateng said the items especially the books would help the children to continue learning while at the Hospital. She said one major challenge the Department faced was improper maintenance of its facilities and called for support from concerned institutions to help maintain it. Hugs for Ghana is a non-governmental organisation focused on supporting underprivileged members of the society in the areas of health care, health and fitness, academics and the welfare of children.